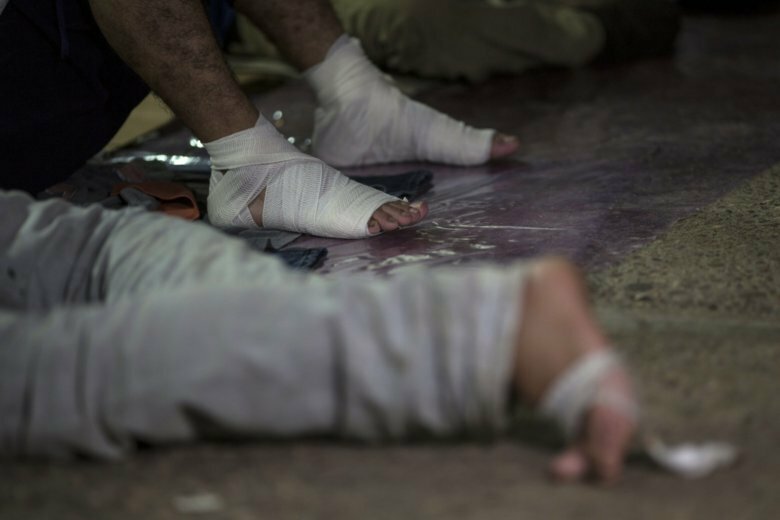 CORDOBA, Mexico (AP) — Tired, swollen and blistered feet are among the biggest challenges for the thousands of Central American migrants making their way through southern Mexico in hopes of starting new lives in the United States. On Sunday, 21-year-old Marisol Salamanca dug into a pile of donated shoes at a sports facility in Cordoba in search of a replacement for the sandals she has padded around in since leaving El Salvador several weeks earlier. “I keep tripping and hurting myself,” she said. Adan Lara Barahona, 62, a wiry rancher from Potrerillos, Honduras, dismissed the blisters on his feet as a minor nuisance. “They are drying out already,” he said, complaining instead of dizziness brought on by a severe respiratory infection. There’s no turning back for Lara Barahona, who says gangs killed his wife and two of his children seven months ago when he didn’t pay them protection money. Many of the about 4,000 migrants in the caravan have now covered more than 800 miles since setting out from Honduras on Oct. 13, hitching rides on flatbed trucks when possible and they face another more than 800-mile trek to the nearest U.S. border crossing. Clamors have grown in recent days for buses to transport scores from the caravan to the Mexican capital, where the fatigued travelers hope to find respite and medical treatment. Those buses haven’t come. The group now finds itself in the Gulf state of Veracruz, traversing what some call the “route of death” because of the large number of migrants who have disappeared in the state in recent years. It is unclear what part of the U.S. border they will aim for eventually, but their latest overnight stay in Veracruz could be one of their last before they head to Mexico City, a potential launching spot for a broader array of destinations. Associated Press writer Mark Stevenson reported in Cordoba and AP writer Amy Guthrie reported from Mexico City. AP writer Sonia Perez D. in Cordoba contributed to this report.